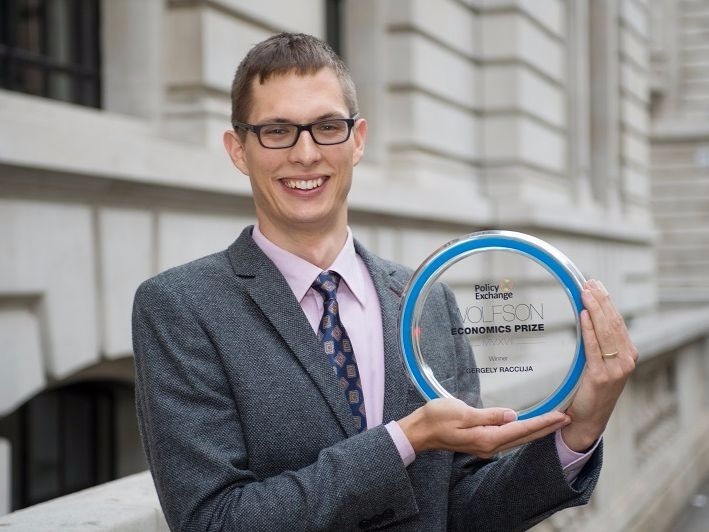 Gergely Raccuja, the UCL graduate who won the £250,000 Wolfson Economics Prize with his road-charging scheme, returned to UCL for a celebratory lecture and dinner. Gergely, who was awarded the prize in July, also updated guests at the event on the progress he was making in pitching his proposals to the Treasury. He said "pushback" from the Treasury on the scheme - a "simple" charge based on the distance you travel in your vehicle - had been less than he expected. Funds raised from the charge would also include a proportion - around 20% - that would be ring-fenced for repairing roads though one questioner pointed out the Treasury was traditionally opposed to such hypothecated taxes. However, Gergely revealed he had met the top civil servant in the Treasury and said: "For them, it's been kind of accepted that this what they have to do to get any kind of road pricing scheme going." Gergely was working as a graduate transport planner at Amey when he came up with his scheme, one that he disclosed had been initially inspired when he was buying car insurance for his wife who had just passed her driving test. He argued that abolishing fuel duty and vehicle excise duty in favour of a simple distance-based charge, with heavier and more polluting vehicles paying more, would be fairer and restore trust between government and motorists. The total amount of tax collected from motorists would be the same as at present, about £27bn, so would ensure revenues in an era of electric and autonomous vehicles. The government is currently losing £2.3m a day in decreasing fuel duty revenues. The charge would be collected by insurers based on mileage and model, a move designed to neuter privacy concerns if the information was collected and stored by the government. Gergely told guests that it met the three key conditions of sustainably. First, it was a fair tax because it was based on mileage. Second, it was environmentally sound because it taxed not just CO2 but also other pollutants. Thirdly, it was beneficial to the economy in that it took account of the damage caused to roads, which contributed to costly congestion, and was cheap to administer and run. Gergely has estimated that the charge would raise enough money in five years to eradicate the UK's potholes. "The beauty of this kind of system is that a proportion of the money raised is hypothecated. If the economy is doing well, then revenues increase not just for roads but for the non-hypothecated bit," he told the audience of more than 120 in UCL Wilkins building. "By re-investing revenues, you improve the road network making it better for business. When I pay a tax and some of its coming back to help me, there's a feeling that it is fairer." Gergely, who was born in Budapest to Hungarian-Italian parents, came to the study at UCL in 2011 before graduating with a first class honours degree in 2015 in politics, urban planning and Italian. From January 2016 he worked as a graduate transport planner with Amey which included a feasibility study for a cycle route and traffic modelling for the dualling of the A47 around Norwich. Since winning the award, he has also been working on pitching his proposal to the Treasury. The Wolfson Economics prize is the second largest economics prize in the world after the Nobel Laureates. It is sponsored by Lord Simon Wolfson, chief executive of retailer Next and is run in partnership with the think tank Policy Exchange. To win the prize which required applicants to come up with a better way to pay for better roads, Gergely, beat off some 120 entries including from the economist Deirdre King and her husband Edmund, head of the AA motoring organisation. Steve Gooding, director of the RAC Foundation, which provided input into Gergely's final submission, said the clock was ticking for traditional ways of funding roads, while Lord Wolfson hailed his proposal as "ground-breaking, yet simple - with the backing of a major motoring organisation." Gergely graduated from UCL's Arts and Humanities' European Social and Political Studies BA. His dean, professor Stella Bruzzi, said: "Warmest congratulations to Gergely. His innovative and forward-looking road charging scheme demonstrates where, in our interdisciplinary century, a degree based in the arts and humanities can lead to. The intrinsic value of doing a degree is that it can show you how to make exciting and maybe unanticipated connections and translating them to the real world. Gergely's research exemplifies this journey perfectly." The event was hosted by Dame DeAnne Julius, chair of UCL Council and UCL President and Provost Professor Michael Arthur who hailed it as a "special" occasion for a "special" person. Also attending were Gergely's wife, Haesul, Professor Mary Fulbrook, dean of the faculty of Social and Historical Sciences, Professor Mark Hewitson (UCL ESPS), Dr Iqbal Hamiduddan (UCL The Bartlett), Dr Maria-Novella Mercuri-Rosta (UCL SELCS), Dr Peter Schroeder (UCL ESPS) and Dr Roland Kappe (UCL SHS).